We are delighted to announce that the 2019 season will be starting from 6th April 2019. Please select your preferred trip under 'The Cruises' section for more details - We look forward to welcoming you aboard! 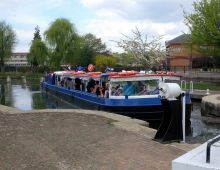 Discover the heritage and rural beauty of the Lea Valley, whilst cruising aboard a modern, fully licensed vessel that is accessible to all. Our aim is to provide a high quality and unique experience to our valuable clients. The amazing rivers of the Lee and Stort, have been well maintained, but with no real opportunity for the general public to experience them for nearly 30 years. The Lee & Stort Boat Co. is once again making our very special rivers and canals available to everyone, young or old, able or disabled, sightseers or party goers. You can bespoke your cruise or private charter to suit the needs and budget of your group or embark on one of our scheduled services. Call 0845 116 2012 to book that "something different" experience. © 2019 Lee & Stort Boat Co Ltd. All rights reserved.